Tag line: "Not just another day at the beach"
I love the beach, I love the ocean, and even though I’ve never set foot on a board in my life, I love surf culture. Add to this the fact that I also enjoy shark movies (even bad ones like Shark Attack in the Mediterranean hold a special place in my heart), and it’s a no-brainer that a film like 2016’s The Shallows is going to draw me in immediately. Medical student Nancy Adams (Blake Lively) has traveled to a remote beach in Mexico, the same one that. 25 years earlier, her mom (who recently died of cancer) visited while pregnant with her. Neither Carlos (Oscar Jaenada), who was nice enough to give her a lift there, or the two surfers she meets in the water (played by Angelo José Lozano Corzo and José Manuel Trujillo Salas) will tell her the name of this beautiful beach, but no matter; she’s there to honor her mother and, in the process, do a little surfing of her own. Later that afternoon, while alone in the water, Nancy spots a wounded whale floating helplessly towards the shore. As she’ll soon discover, this whale was the victim of a shark attack, and she herself has accidentally stumbled into the feeding territory of a ferocious great white. Before she knows what’s hit her, Nancy is bitten on the leg, and, in an effort to escape the humongous beast, she swims first to the whale (using it as a life raft), then to some rocks, where she does her best to close the gash in her leg. Realizing there’s nobody else around, and that she’s several hundred yards from the shoreline, Nancy spends the next day or so doing what she can to survive, all with the knowledge that the shark is still lurking nearby, and has no intention of leaving until it’s finished her off. With plenty of slow motion, a techno soundtrack, and even some underwater photography, the early moments of The Shallows, where Nancy and her two new companions are out catching some major swells, feel more like a surfing documentary (a la Step Into Liquid or Riding Giants) than they do a horror film (the movie was shot on-location at Lord Howe Island, a picturesque locale situated in New South Wales, Australia). That changes, however, the moment Nancy paddles out to that whale, at which point director Jaume Collet-Serra kicks the tension up a notch. From there on out, The Shallows is, for the most part, a one-woman show, and Blake Lively does a terrific job in the lead role, conveying the pain, fear, and frustration her character feels while trying to deal with a very frightening situation. In addition, the movie features a fairly impressive CGI shark (we don’t get to see it all that often, which makes the scenes when we do all the more effective). I did have one issue with the film, and that’s the way it handled the shark attacks. 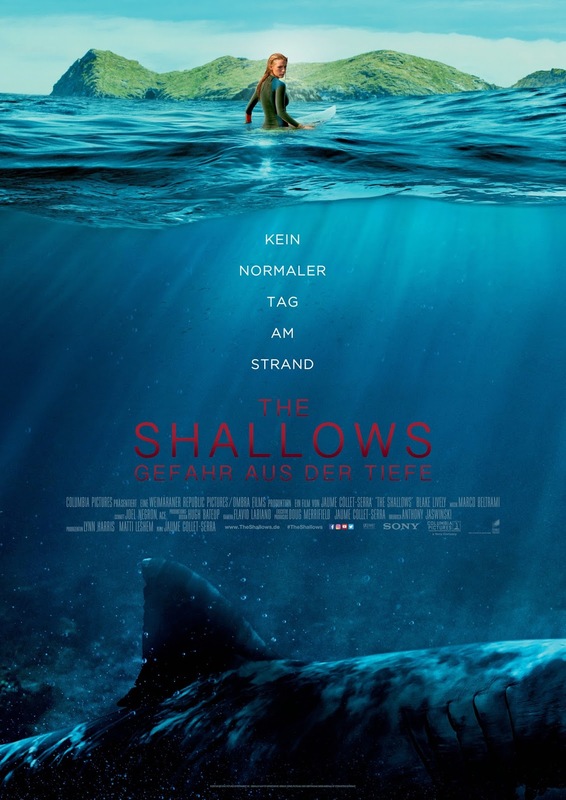 To be fair, I knew going in (thanks in part to its PG-13 rating) that The Shallows would be light on blood and gore, yet I still felt cheated by a scene that involved a vagrant on the beach (the ending of which happens off-screen), and while the shark does attack others on several occasions, we ultimately see more of Nancy’s blood spilled than all of the remaining victims combined. 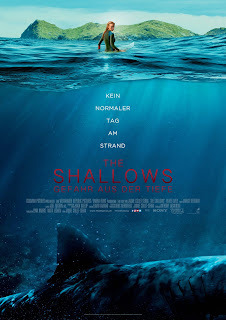 Still, I consider this a minor quibble, and if, like me, you enjoy a good shark story every once in a while, then you should definitely check out The Shallows as soon as you can. This movie freaking got me by surprise. I thought for sure it would be a piece-o-crap. But, it was surprisingly entertaining, suspenseful and slightly scary. And Blake Lively held it all together. She almost gave me a Tom Hanks-Castaway feel. Good for you Blake, keep up your good work. I started watching it and up to the point where I know she's going to get in trouble...I turned it off. I think because all I could think was: "I've seen this all before. Enough." I may try watching it again some day. Slight chance.